My first trip to Rosewater was uneventful. There wasn’t necessarily anything wrong with it, there just wasn’t anything memorable about it. We did a chef’s tasting menu a few years back for my birthday. It was a great value—Five courses for $60 and add the (I think necessary) wine pairing for just $26 more. Five courses and wine for under $100 a person. You can’t get much better than that. At most restaurants, especially in Manhattan, I find you can barely clear 3 courses, paired with water, for that price. I remember enjoying the food but the next week, even the next day, I couldn’t recall any specifics. I judge a meal based on experience and how it lingers over time. There are meals I’ll remember for a life time. My first dinner at Blue Hill where my husband told the waiter to “challenge us”. The rich, yet feather light gnocchi at One if by Land, Two if by Sea. The tiny bistro in Quimper, France where language was a barrier but the waiter’s oinks (yes, oinks, not a typo) communicated the pork loin was his favorite dish on the menu. But my dinner at Rosewater lacked staying power. After walking out of the restaurant, it seemed to evaporate from my memory. With so many other restaurants to try in Brooklyn alone, I wasn’t overly anxious to return. Though it happened we were in the area for brunch and figured, why not? I’ve never been so happy to give a restaurant a second chance. 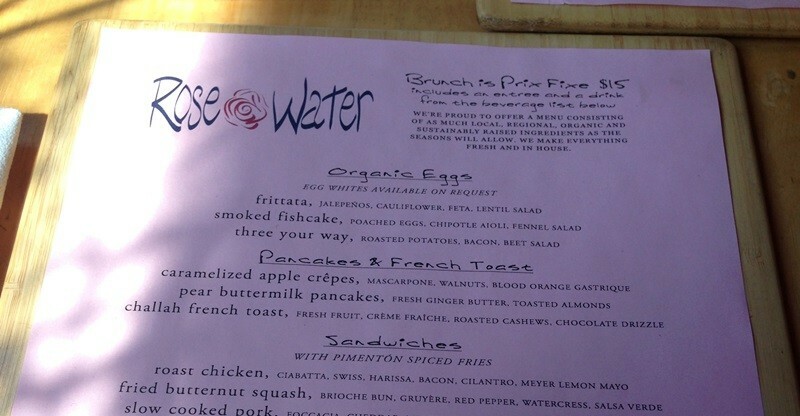 Rosewater’s Brunch is prix fixe, including an entrée and nonalcoholic beverage. Brunch is meant to comfort you after a long week or a late night. Start with the coffee—trust me. Rich and strong with just enough bitterness to wake you from your weekend morning grogginess. 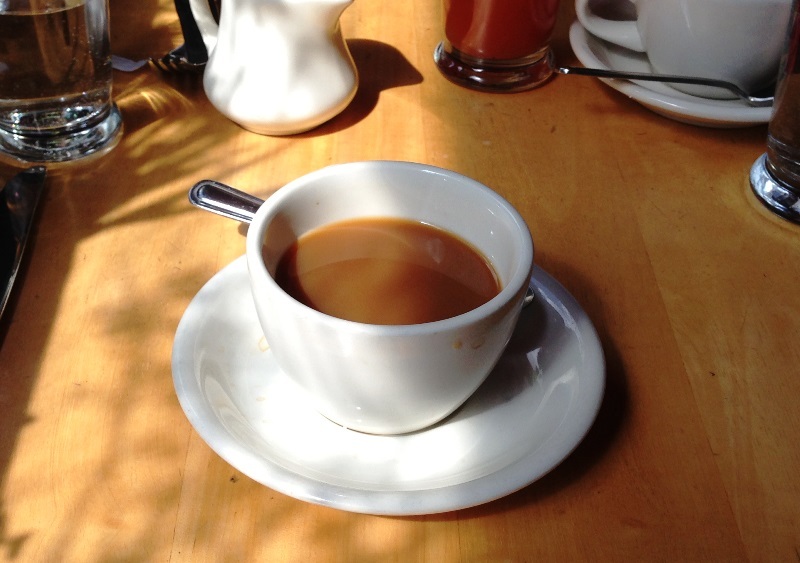 Generally I go for a mimosa with brunch, but that cup of coffee (…with a few generous refills) was all I wanted. What I love about brunch is the choices. Breakfast or lunch. With many NYC brunch spots going well into the afternoon, pancakes at 2pm is completely acceptable. My normal breakfast is yogurt, fruit and sometimes granola. I live for weekends when I have the time to sit down for a real breakfast, whether it’s dining out or prepared at home. Eating an earlier brunch at noon, I surprised myself when my eyes quickly skipped over Rosewater’s decadent sweeter options (pear buttermilk pancakes anyone?) and zeroed in on the more savory dishes. 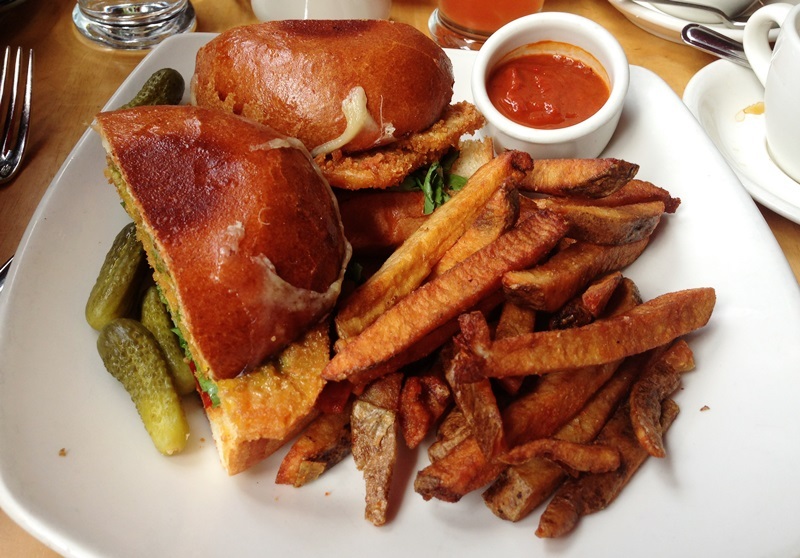 Fried butternut squash sandwich. Complete with Gruyère, red peppers, salsa verde and watercress. Butternut squash might be one of my favorite comfort vegetables. I’ve had it raw, roasted and pureed, but never fried. I was instantly intrigued. The sandwich was perfect. Somehow the chef managed to fry the breaded squash, keeping it extra crispy with a silken center. Creamy, nutty Gruyère and sharp red peppers perfectly highlighted the dish, served alongside a generous helping of spiced fries. Really, you can never have too many fries in your life. Like many NYC brunch spots, Rosewater does not take reservations and the later you arrive the longer you should be prepared to wait. We sat down just after noon and only waited a few minutes. As we dined in Rosewater’s 4 season covered “outdoor space” we watched the crowd outside multiplied. We arrived at just the right time. Dinner is served 7 days a week and reservations for all party sizes can be made via phone. I’m particularly excited to sample Rosewater’s weekday seasonal prix fixe meal. Three courses for $28 plus a wine pairing for practically pennies more. Rosewater, we’ve been kept apart for far too long. But don’t fear. It won’t happen again. I will be back very, very soon. Some of the best breakfasts I’ve had in my life have been during the short time I’ve spent holidaying in the US. You guys know how to do breakfast-brunch. Haha, yes we do. And sometimes well into the afternoon or even all day. When I lived in New Jersey, there was always a handful of diners in a few mile radius. I loved that I could get pancakes or eggs at any hour. That sandwich looks great and right up my alley!